Huge numbers of incoming Chinese tourists consequently demanded additional guiding workforces. Native Chinese seem to be the good option for guiding excursions around the city due to their obvious high linguistic qualification. But it turned out that their knowledge of St. Petersburg’s culture and history and Russian realities is very far from the reality. The city government urgently decided to establish a special group to address the problem of illegal guides’ activities. 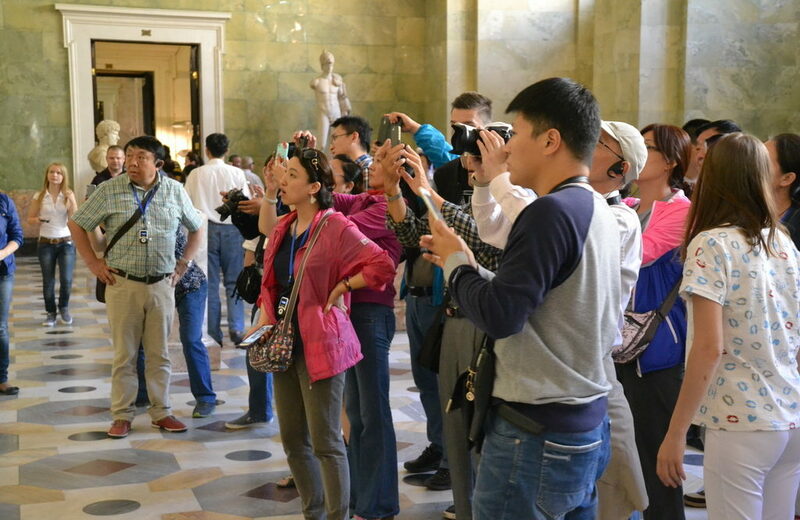 One day, a correspondent of Fontanka.ru, the biggest St. Petersburg news website, joined a few groups of Chinese tourists in the Peter and Pail fortress and recorded what Chinese guides were telling their compatriots. Then the records were given to Russian Chinese-speaking guides who helped with translation. The Fontanka’s publication caused a burst of laugh among the public, anger among Russian guides and raised some concerns in the government. We republish the most outstanding and shocking statements collected in the Peter and Paul fortress and some other tourist places around St. Petersburg. “Pushkin (the most popular and greatest Russian poet Alexander Pushkin was sent to Russia by an African king and learned Russian language with the help of his Russian wife”. By clicking on the link to Wikipedia, you can count the number of mistakes in just one phrase. Being born in Russia, Pushkin naturally spoke Russian from his childhood, though, of course, admitted that he preferred French language what was habitual among the Russian nobility at the time. At the Hermitage museum a Chinese guide called Raphael’s The Holy Family painting a Leonardo da Vinchi’s painting. Surprisingly, Josef from The Holy Family suddenly became the Jesus’ father. Another interesting fact about Russia which we could learn from the Chinese is that Russian women prefer having children without being officially married. Why do you think they’re doing that? Well, as a Chinese guide reportedly explained to his clients, the Russian government helps such children and gives their mothers a lot of money until the children are 16 years old. The fact is that this phrase has nothing in common with the reality. The women’s theme goes on in another comment regarding the disparity of sexes in Russia. One Chinese guide said that the current situation, when 55% of the population are women and the rest 45% are men, is caused by the fact that women prefer eating meat which has impact on the contents of acids in a body and, as a consequence, Russian women could give a birth to girls only. So, how come boys are also being born in Russia? Well, we cannot explain this. Following the logic of the guide, we can suggest that they are getting out of vegetarians and vegans. Russian guides are consistently trying to get the government to pay attention to activities of illegal competitors, particularly by pointing out that a lot of excursions are being conducted by Chinese students who are merely not qualified for the job. The lobbyists have not had much success so far, but now things seem to be changing due to the increase in Chinese tourist traffic. It’s just getting more a political issue than a tourist one. Andrey Mushkarev, the newly appointed St. Petersburg tourism committee’s chairman, claimed he would establish a working industry group to deter the activities of illegal and low qualified guides.